Every day in the life of a sales manager is filled with a variety of tasks, challenges and decisions that need to be made. Some days it may be prospect meetings, lunches & dinners, other days it may be preparing for presentations and working with teams to setup demos or figuring our pricing for an imminent deal. Other activities include competitor analysis, preparing for forecasting or other internal meetings, keeping Salesforce and other systems up-to-date and many more such tactical and strategic tasks. With so much going on they do not have time to look at large amounts of data and make sense of the tens of reports or even charts. The problem with reports is that they are generated keeping in mind the requirements of an entire organization – they are not tailored to meet an individual’s needs. Charts and graphs with filtering capabilities are meant to fill this gap as they provide a user the ability to select filters that are meaningful to them. However this approach also breaks down when a user only wants to know about critical changes and outliers in real time. SpringML’s Lighthouse app has an automated way to generate Insights Summary. These textual summaries are created using various machine learning and data mining techniques to identify patterns and outliers. Here are examples of such insights. With this information users are less likely to overlook important changes or trends – both short term and long term. There’s a ton of activity happening in any sales life cycle – opportunity amounts being increased or decreased, close date moving in our out of a quarter, opportunities moving ahead or going back in stage, etc. How can management keep their focus on deals that are most important and strategic? If there’s a new strategic product that they want to gain customers for how can they take immediate action if an opportunity with that product is stuck in a stage or worse moves back a stage? What about such changes happening for a very important account? 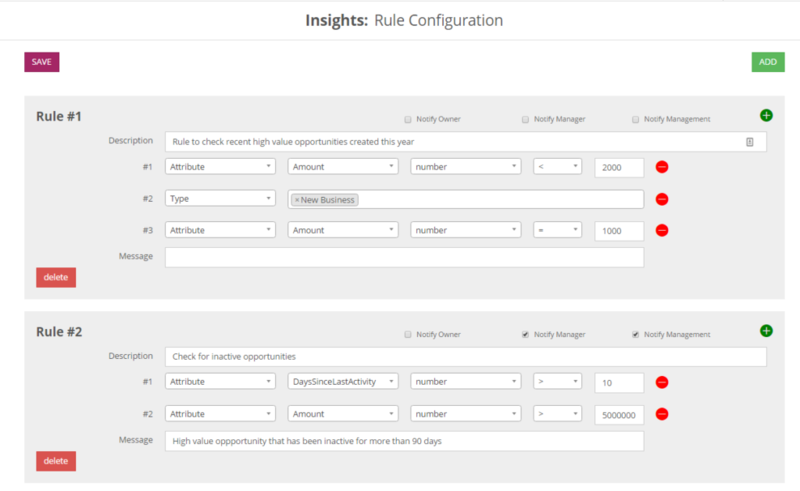 In addition to automated insights SpringML’s Lighthouse for Sales provides a rules engine that allows users to configure rules based on characteristics that are meaningful to them.